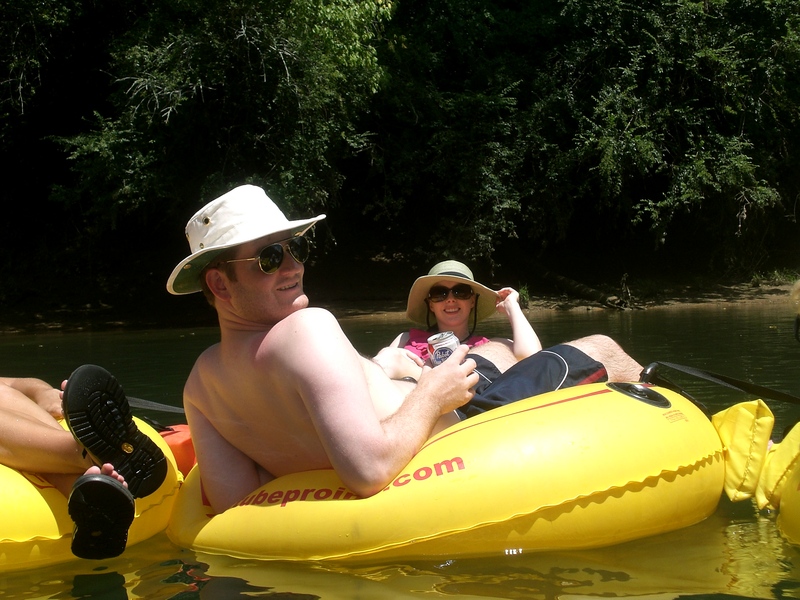 Now that we’ve lived in Atlanta for a few months, I thought I’d do a little post about how much we love it. I’m not sure anyone would officially call us “Atlantans” yet, but we do subscribe to Atlanta Magazine…so that’s gotta prove something. Before we thought about moving here, all we really knew about Atlanta was that it gets hot (HOTlanta, duh), and that it supposedly had awful traffic. We experienced the traffic only once, when we were on our way to a wedding event for Sandy and Kate in 2007…but that’s all. Earlier in September, we went to see the Braves play the Mets (Braves won! )…and TONIGHT, we’re going to see the final game of the season! It will be a fun, exciting game… and the stadium will be full of energy, I’m sure. I just hope there are some funnel cakes left once I’ve polished off my hot dog and my sweet tooth starts up…around inning 8 I’m guessing. 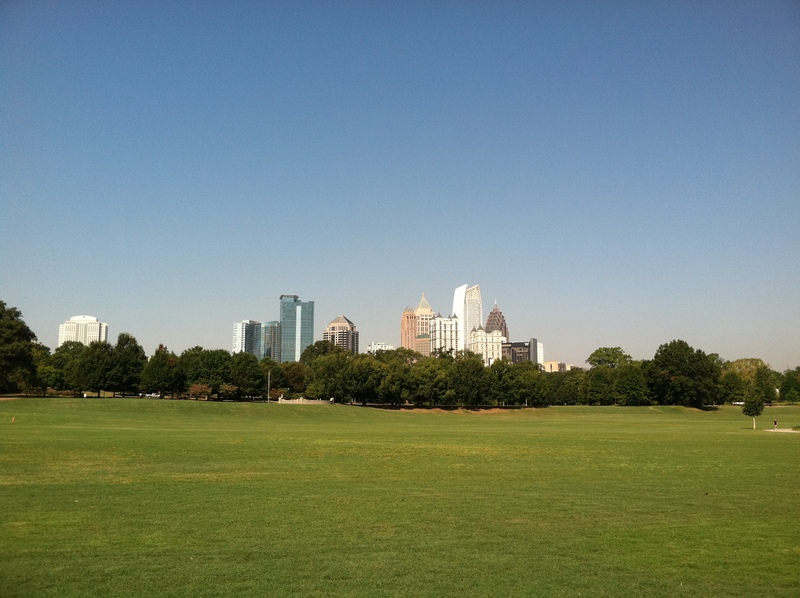 Another favorite spot of ours is Piedmont Park. We take Chance on a long walk there every weekend, and we love it. It’s a huge park with great skyline views, and it’s always full of people… unless you’re unemployed and you go at 11am on a Tuesday like I sometimes do (see empty park below). Just a few weeks ago, we went for our usual stroll, and we happened upon an arts festival! You’d think we would have heard about it – but apparently we aren’t reading the right paper. Anyway, we showed up for our walk and found hundreds of tents filled with fun, whimsical art! You’ve obviously heard about the Dekalb Farmers Market…I usually don’t take photos there because there are large signs forbidding it, but I’m glad that some people take photos and allow me to steal them. 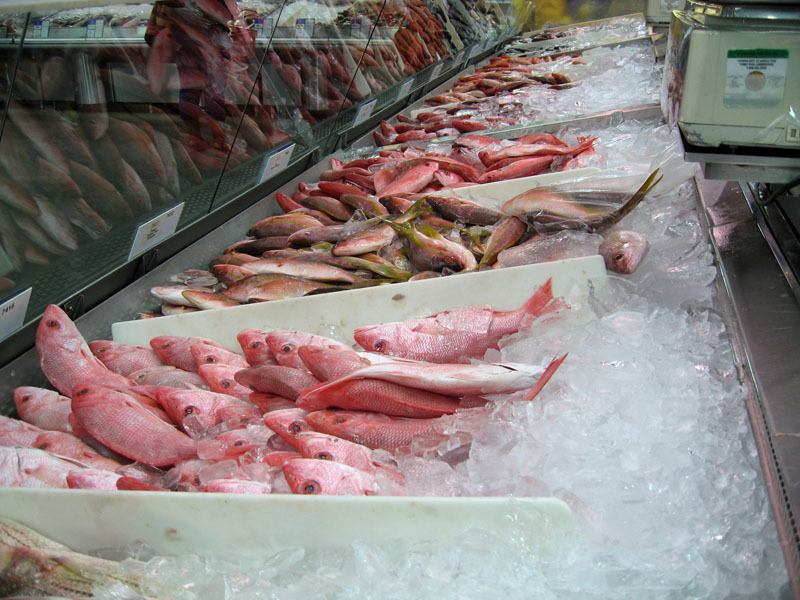 Here’s a little shot of the huge whole-fish section. It’s such a fun place, and we love going there to stock up on cheap produce and meat (and Malawi sugar!). The only trick is you have to go early (to avoid major crowds), bring a sweater (to avoid freezing to death), and pay with a debit card (which is often worrisome when you buy in the quantities that we do). 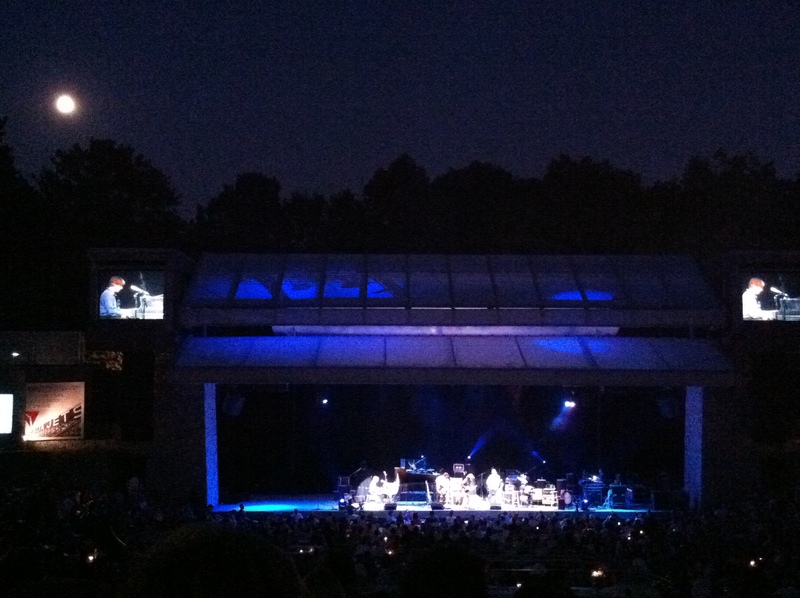 Another fun adventure was the concert at Chastain Park (another huge, awesome park). We went to see Bruce Hornsby and the Noisemakers and Bela Fleck and the Flecktones. Typing those band names kind of makes me want to call us The Rordams and Their Picnic Basket. The best part about the amphitheatre is that you can bring a picnic and wine/beer is allowed! We snacked on hummus, cheese and crackers, carrots, a mini charcuterie plate, and some wine and beer…all while listening to great feel-good music. hat, sunglasses, dress, sunscreen...all that, and I still got burned on my legs. Tomorrow night we’re going to “Cocktails in the Garden” at the Atlanta Botanical Gardens, another spot we’ve been dying to see. They have live music, free appetizers, and a cash bar…. and you just roam around the gardens and see the sights. I’m so excited. We’ve been busy, huh? We still have loads more on our Atlanta-Bucket-List, including touristy things like the Aquarium, Zoo, and World of Coca-Cola…but we’re obviously on the lookout for fun local-y things, too. Bottom line, we love living here, the traffic isn’t all that bad, and we really feel like this was the right move for us. Of course we miss Richmond and our friends and family there, but we’re where we should be. If you know of any Atlanta must-do items, please let us know! In the meantime, we’ll keep exploring! Loved your ode to Atlanta and all the awesome pictures. 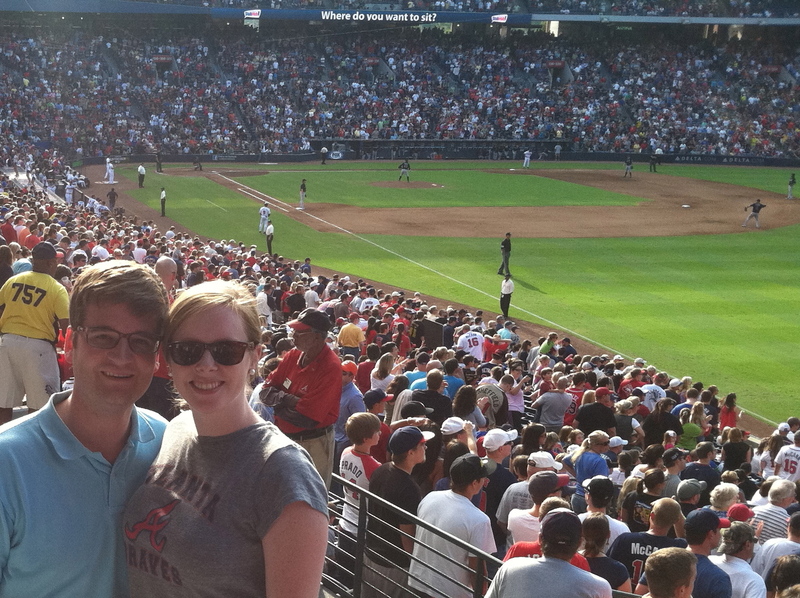 How fun to have the the Braves game from years before–Alex and Mary Katherine, we loved the picture! Gardner and Mary Katherine, it is late and we are watching the Braves with you . . . ! Lived in Atlanta for many years and it is one of the best places to be young … and a gourmond!! !